Next up to the platebook #6 in our early chapter book mystery series, where each book is set in a different American ballpark! Ivy-covered wallsthey're the most famous part of the Chicago Cubs' historic ballpark, Wrigley Field. Mike and Kate can't wait to get down on the field to see the ivy for themselves. But when they do, they're horrified to discover patches of the ivy have been ripped away! Who would want to sabotage the stadium? Is it someone trying to curse the Cubs? Or is the rumor of a treasure hidden under the ivy tempting greedy fans? 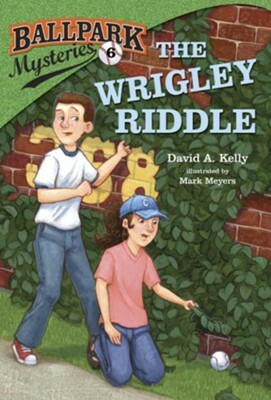 The Wrigley Riddle includes a fun fact page about Chicago's Wrigley Field. Cross Ron Roy's A to Z Mystery series with Matt Christopher's sports books and you get the Ballpark Mysteries: fun, puzzling whodunits aimed at the younger brothers and sisters of John Feinstein's fans. 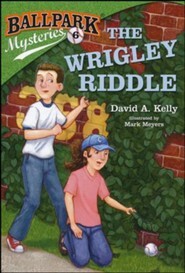 DAVID A. KELLY has written for many newspapers and magazines, and Babe Ruth and the Baseball Curse, published in spring 2009, was his first book for children. He lives 15 minutes from Fenway Park in Newton, Massachusetts, with his wife, Alice; two sons, Steven and Scott; and a dog named Sam. MARK MEYERS grew up in Utah and studied art in San Francisco at the Academy of Art University. I'm the author/artist and I want to review Ballpark Mysteries #6: The Wrigley Riddle - eBook.